Limb Music is re-releasing Wizard’s back catalogue, and instead of writing a review for each separate album, I’ve decided to write one review for the two albums I received, the 2001 ‘Head Of The Deceiver’ album, and the 2005 ‘Magic Circle’ album. 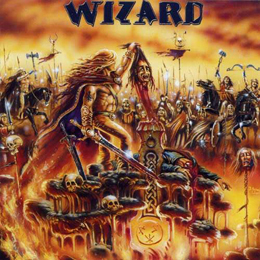 Knowing Wizard is a German band, I was curious what type of metal these guys play, as I seem to have missed them completely, although the band exists since 1989, however I must admit that the late eighties were a period were my musical interests were more focused on AOR and hard rock, rather than true metal. And when playing these albums I was pleasantly surprised. These German guys don’t bring us the typical German metal, but rather sound a bit like American band Manowar. And the sources or inspiration for their song texts are also rather similar to what the aforementioned band brings us. Personally I like the older album more than the 2005 release, and that has partly to do with the drums, who sound rather flat on that album.